All senior leaders will be along with Rahul Gandhi during these programmes and this will be the "first leg" of the campaign by the Congress president. 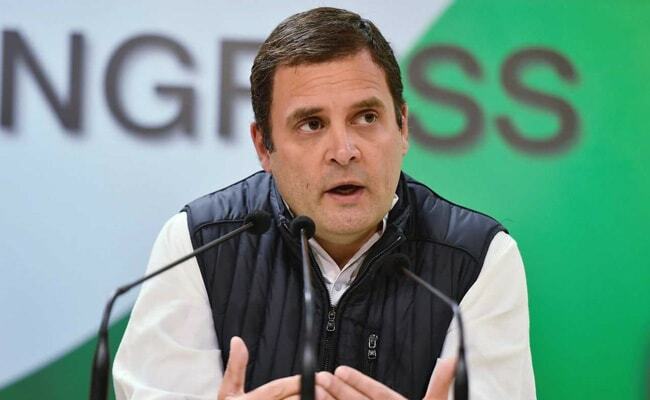 Bengaluru: Congress President Rahul Gandhi will kickstart his electioneering for the coming assembly polls in Karnataka on February 10 with the party drawing up an "aggressive" campaign at the grassroot level to strengthen the booth level management of elections. Sharing details of the visit, Karnataka PCC chief G Parameshwara said Mr Gandhi would launch the campaign at Hospet on February 10 by addressing a rally there. Next day, he will travel to Koppal, Yadgiri, Raichur and Kalburgi by bus, he told reporters in Bengaluru, adding, he would visit parts of the state on February 12 also. He would address public meetings and interact with the public. Tour details are being finalised, Mr Parameshwara said. Asked if Mr Gandhi will be visiting temples during his tour as he did during the Gujarat assembly poll campaign, the KPCC president said "if it happens it will be incidental and there is no regular plans as such." "When he is visiting a place if someone asks him to visit a temple, he may choose to do so, there is nothing wrong in it....we have not finalised any religious places for his visit," he said. Rejecting that Congress was planning to practise 'soft Hindutva' during the campaign through such temple visits, Mr Parameshwara said "we are inclusive Hindus." In the run up to the state assembly polls, the ruling Congress has planned a "massive" and "aggressive" campaign at the grassroot level to strengthen booth level management of elections. "Next one month, entire February there will be massive aggressive campaign at the grassroot level," Congress general secretary in-charge for Karnataka K C Venugopal said. He said every leader of the state congress including the chief minister and PCC chief has been given responsibility to look after one booth each. Panchayat level meetings would be convened from February 1 to 15. "From February 15 to March 1, we have made sub-groups at booth level who will go door-to-door and collect data on electioneering which will be reported to PCC," Mr Venugopal explained. Post this grassroot outreach programme, in March all state Congress leaders will be touring the state together. This initiative by the state congress is seen as counter to BJP s concept of having 'Page Pramukh' or 'Panna Pramukh', who will be in charge of about 30 voters on each page of the voters list. The two leaders were talking to reporters after a meeting with block committee presidents, district presidents, state PCC office-bearers and general secretaries to draw up the strategy for the campaign. Chief Minister Siddaramaiah also attended the meeting. Information is being collected about the social media presence of booth and block committee members and those who are not on WhatsApp are being asked to join, the KPCC chief said.